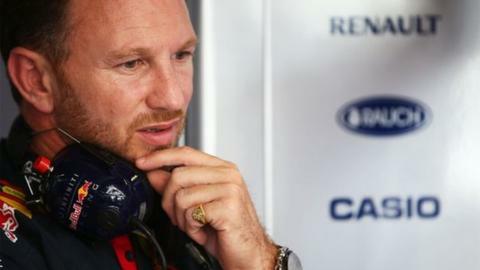 Red Bull team principal Christian Horner discussing the sport's financial problems publicly is "the wrong way to do it"
Christian Horner has told Formula 1's struggling teams to stop harping on in public about their financial issues. Force India, Lotus and Sauber all considered boycotting the United States GP in protest at what they see as an unfair split in revenues. But Red Bull boss Horner says any protests should be done in private. "What F1 has done during the last couple of weeks, with the public slanging matches that have gone on, is not good for the sport," he said. "Doing it publicly is the wrong way to do it. "The sport should be focusing on what we have seen in America - good racing, wheel-to-wheel racing. "The politics and the fiscal issues should be dealt with behind closed doors, with the commercial rights holder, and get sorted." The smaller teams receive a relatively small amount of income from F1's commercial rights holders. Rising costs coupled with a decline in sponsorship and worldwide television audiences means they are under increasing pressure to find the money to compete. The sport's two smallest teams, Marussia and Caterham, went into administration last month and missed the US race. Formula 1 boss Bernie Ecclestone has said he was to blame for the financial problems afflicting some of the smaller outfits. Talks are planned this week, ahead of Sunday's Brazilian Grand Prix, aimed at trying to solve the issue.